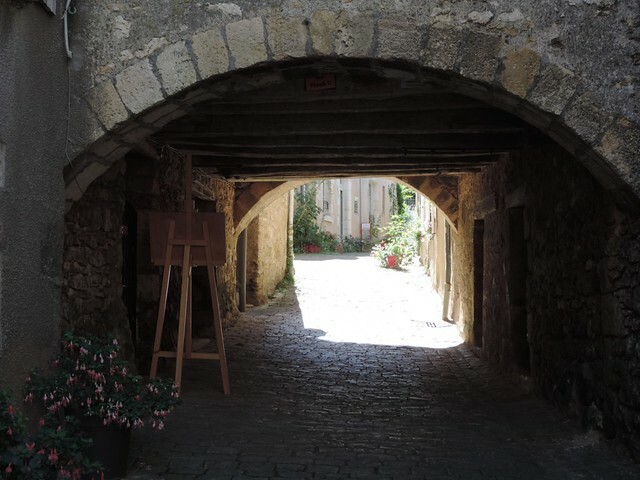 There are a lot of medieval villages in France and this passageway in Angles-sur-l’Anglin is typical. Here’s what appeals to me about this view. I love the archway first of all. There’s something very appealing about the arch of a bridge or a passageway. I love the tunnel-like nature of the passageway too. You know the phrase about “light at the end of the tunnel”? Well, there’s light at the end of that tunnel and draws you towards it. You feel like you want to go that way, to follow the light. Then there are the plants. Both the flowers up close (down on the bottom left of the photo), and those in front of the houses we can see in the light. There’s an extra appeal from the easel someone has placed at the entrance. It stimulates my thoughts about creativity and about art, and so tunes me in to the aesthetic qualities of the scene. And it’s facing the other way! So there’s a mystery there. What is on the easel? You have to use your imagination to get the answer. I also like the cobbles. I know it’s not much fun walking or cycling over cobbles but there’s something very pleasing about them and that got me wondering about the Japanese “wabi sabi” aesthetic which doesn’t try to make something “perfect”….or at least only perfect in the way that Nature is perfect. There’s something of that in the appearance of most of the buildings in these old villages. There’s nothing shiny or sparkly or gleaming about them, and that gives them a greater quality of age and having been lived in. Finally, I like the contrasts of the light and shade. The one needs the other and together they make something that feels very whole and appealing.